“So much to do, so little time.”? That seems to be our new mantra ’round here as we transition from the old website to the new, from summer to fall (big transition in the knitting business) and just generally try and keep from being buried in wool. Not that we’re complaining… especially about that last bit. Now, let’s see, we’ve had a slue of recent happenings. The most noticeable will have been Lindsay’s first blog post last week. Lindsay is our web fulfillment person and will be blogging (hopefully) once a week about customer and staff projects. If you’re a web customer and want to share your current wip or recent fo, be sure to shoot Lindsay an email [info(at)knit-purl(dot)com] and she’ll be glad to blog about it. Something you cannot but love, right? 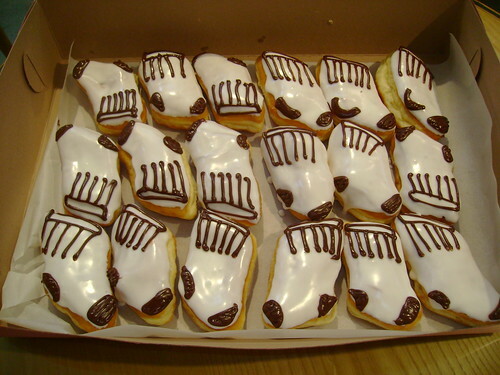 Socks and doughnuts… together in a non-sticky-wool way! I’m afraid I have no more information than that. 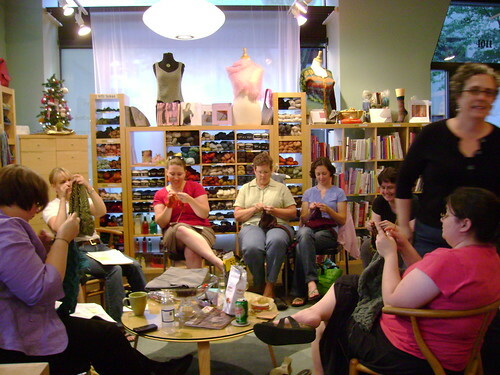 Maybe the knitter (or the knitter’s friends) read this blog and might help a poor, befuddled knit-blogger out? Now, onto the more recent goings-on. First, very exciting, we have our Twitterific Sock Contest! Don’t know about this? 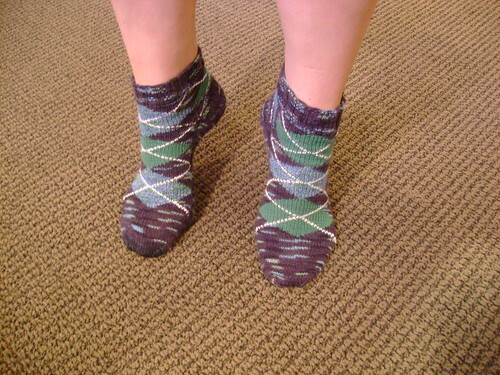 Check out our most recent Newsletter or the Twitterific Sock Contest page. 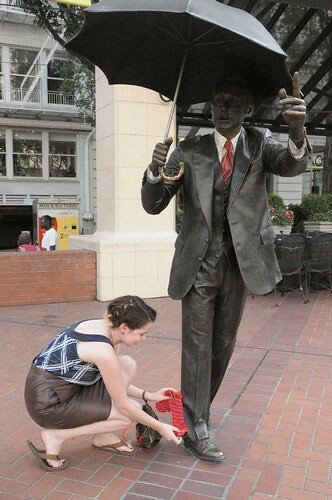 Lindsay and I had fun with entertaining the masses at Pioneer Courthouse Square. If you’re thinking about participating, do! The prizes are amazing (one year’s membership in the Sock Club or a KnitPod or ShibuiKnits Sock yarn) and it’s not hard to enter. Seriously. 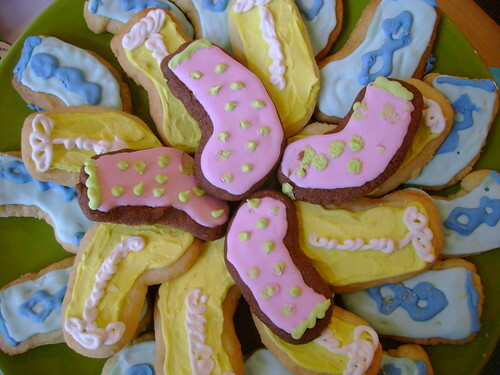 If the Sandies can tweet, anyone can. But, it’s worth mentioning (aside from the ha!-we-caught-you factor), as three of the knitters last night were working on their Girasole Shawls from our recent KAL. 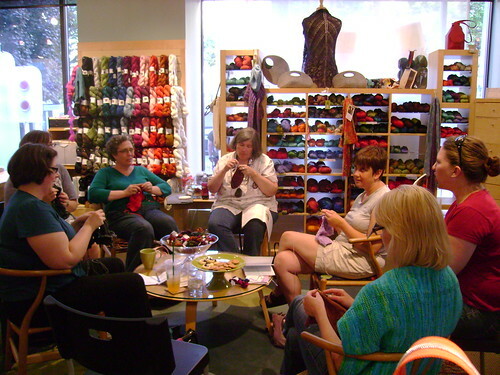 It was a nice big group, too, with ten knitters on the first night! Maybe lace knitting is bigger than we think, but just really really quiet. Anyway. Until next time, you might want to check out our lovely Twitterific Sock Contest page, our recently updated Calendar of Events page and, quite possibly, stalk #twitterificsock on twitter. It’s gonna be great! * We’re good at that, we know. **Nice try, Marj & Leslie. 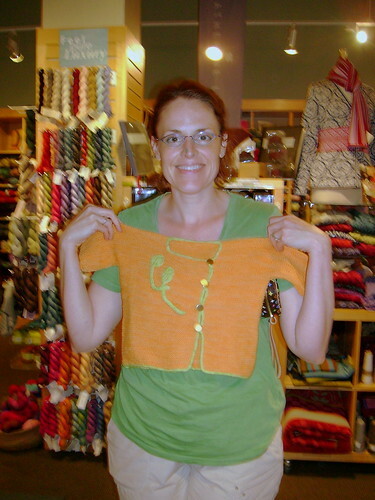 The post You know how the saying goes… appeared first on Knit Purl Blog.